The cleanest of the dirty shirts doesn’t necessarily preserve your purchasing power. Sure, the U.S. dollar has beaten the Russian Ruble and some others of late, but when it comes to real competition, the U.S. dollar has taken a back seat. The U.S. dollar’s long-term decline may be firmly in place and investors may want to buckle up to get ready for the ride. Historically speaking, the dollar has typically weakened in a rising rate environment. This is due to the fact that foreigners tend to be large holders of Treasuries, and as rates rise, those Treasuries are at risk of losing value, and provide a disincentive for foreigners to hold them. As a result, the dollar has historically benefited during late stages of a tightening cycle as the decline of Treasuries might be reverted yet again (i.e. the next bull market in Treasuries is anticipated). Having said this, we are not in a “typical” environment, which makes relying on myths even more problematic. More importantly, we don’t think we can afford positive real interest rates. The biggest threat we face might be economic growth, because a stronger economy may warrant higher interest rates in order to contain rising inflationary pressures. 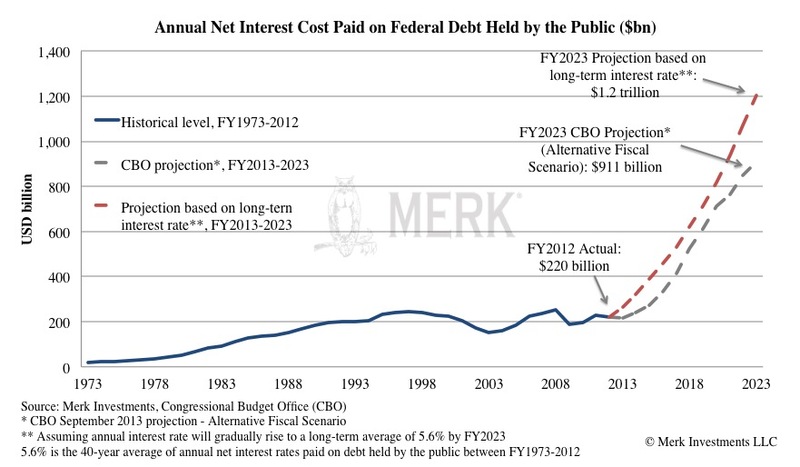 If interest rates were to be elevated so that the cost of borrowing for the U.S. Government would revert back to its historic average, the annual interest expense may rise from the current $220 billion a year to $1.2 trillion a year, thus crowding out other government spending. Fed Chair Janet Yellen testified in no uncertain terms that the Fed’s dual mandate to promote both price stability and maximum employment is no conflict because inflation is not a problem. I don’t recall former Fed Chair, Ben Bernanke, ever explicitly denouncing the Fed’s price stability mandate and to provide further substance to this view, the Fed has all but promised to be late in raising rates. That’s not a surprise; we think the Fed needs inflation to push up home prices (to bail out millions of home owners that are still ‘under water’ as they otherwise make for bad consumers) and to dilute the value of government debt. Higher inflation rates will likely spell bad news for the U.S. dollar. 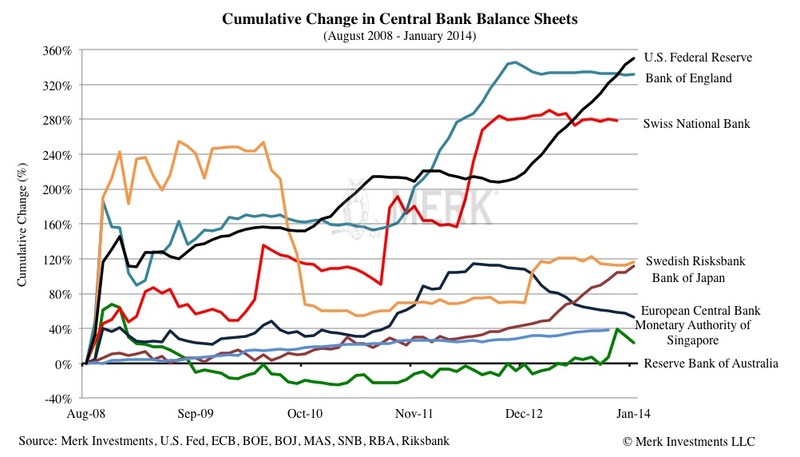 As the central bank balance sheet comparison shows, the European Central Bank (ECB) has been mopping up liquidity rather than “printing” more money. 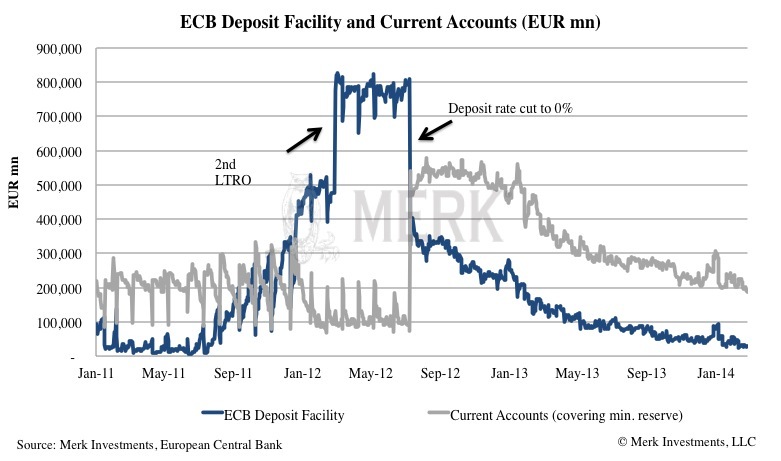 Unlike the Fed that prints a boatload to buy securities, the ECB’s liquidity operations are demand driven. That means so-called long-term refinancing operations (LTROs) are conducted to temporarily give banks cash for posting collateral. However, for a variety of reasons banks have returned unwanted liquidity. Even more worrisome would be if the ECB were to indeed impose negative interest rates that may potentially cause a major public backlash. Let’s not forget that one of the missions of any central bank is to promote confidence in a currency and while we don’t think negative deposit rates would have a meaningful economic impact, the public outcry may be dramatic. Think of the headlines in German newspapers, “First they took our Deutsche Mark, now they steal our euros!” – In our opinion, it will be far less likely that German policy makers will go along with another bailout especially if public sentiment about the Eurozone could be put at risk. In fact, we think this would be an irresponsible tradeoff given the rather limited effectiveness, and potential for severe downside risk. In practice the ECB has mostly limited itself to talking down the euro. Any attempt to talk down the euro has only lasted from a few hours to a few days. The ECB has also cut rates, causing the currency to weaken for a few weeks. ECB President Draghi has also encouraged the creation of an asset backed securities market, i.e. securitizing an amazing amount of Eurozone assets, in order to boost economic growth. The main problem with this idea is that it takes years to develop such a market (and has its own sets of risks). Then there’s the talk of the ECB engaging in broad based asset purchase programs akin to what the Fed has been doing. While technical issues of such a program might be overcome, what exactly would this program achieve? Lowering yields? Well, that’s happening where it’s needed, in the Eurozone periphery and Germany doesn’t need the additional jolt. Just because it wouldn’t make much sense doesn’t mean it won’t happen. Maybe the euro will weaken if such a program is announced, but because of the limited effectiveness, such weakness may yet again prove temporary. The Eurozone has another major advantage over the U.S. and although more difficult to quantify, the massive Fed purchase programs cause U.S. asset prices to become distorted. It may not be possible for capital to be allocated efficiently, and thus create the risk of asset bubbles. While U.S. policies cause ripple effects throughout the world (there are plenty of other central banks pursuing similar policies, most notably, the Bank of Japan), the Eurozone is showing important signs of healing. It’s important to note that when a crisis flares up in the Eurozone, we longer see the so-called risk of contagion like we did during the peak of the crisis in Cyprus, Spain. Where they held a Treasury auction paying the lowest yields since the early 1990s. Of late, hedge funds are buying Greek banks, as well as Spanish real estate. We are not suggesting these are good buying opportunities, but it is a very healthy development that so-called “risk friendly” capital is exposed to what are clearly risky assets. Should these investments fail, it is a hedge fund losing money, rather than a major European bank. A key driver behind many of the reforms that have been undertaken is from the pressure of the bond market. 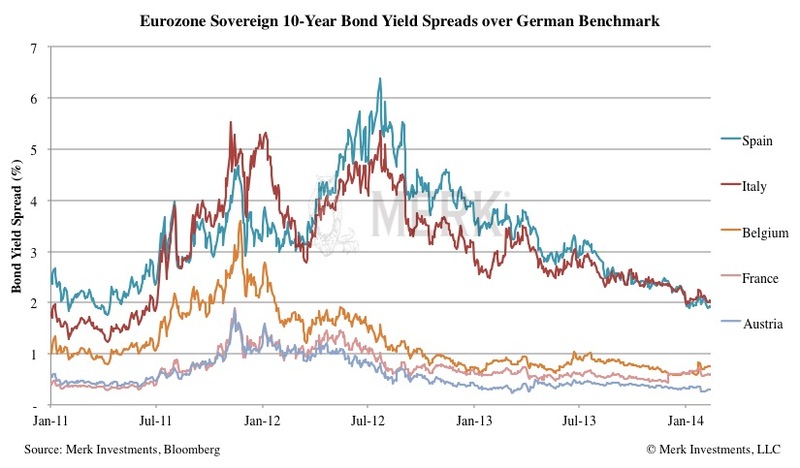 Don’t get us wrong there are plenty of challenges left in the Eurozone, especially as bond market pressure has abated. But in our assessment, it is wrong to conclude that the euro must be weak as a result. Coming back to the U.S., one of the greenback’s greatest vulnerabilities may well be its current account deficit. In plain English, the current account deficit is the amount needed to come into the U.S. in order to keep the dollar from falling (hence the view that the deficit suggests foreigners want to invest in the U.S.). Even with recent improvements in the current account deficit, the U.S. still needs to attract over $1 billion U.S dollars every day to keep the currency from falling. Having said that, the current account balance is not a good predictor of exchange rates. In our analysis, it is an important indicator of the potential vulnerability of a currency. Think about what may get U.S. policy makers to make the tough decisions to get our deficits sustainable? We think it is the pressure of the bond market. However, for the Eurozone as a whole, budget deficits were financed internally, even during the peak of the crisis. In contrast, the greenback relies on inflows from abroad and as such, if bond market acts up the U.S. dollar might come under more pressure than the euro has ever seen and would force policy makers to impose reforms. Don’t miss another Merk Insight: sign up for our free newsletter where we discuss how the U.S. dollar, gold and currencies impact investors’ portfolios.